The HSM Securio B24 Cross-Cut Shredder (4.5 x 30mm) is an office shredder capable of shredding between 17-19 sheets of 70gsm paper at a time (or 14-16 sheets of 80gsm). In addition to paper, this shredder can also handle CDs/DVDs and credit cards - and it will take staples and paperclips too. There is a separate slot for the shredding of CDs/DVDs and also a supplied CD waste bag so that you can separate out the different types of recyclable waste. A handy inspection window lets you see when the shredder needs emptying and the bin is 34 litres in size, good for large shredding requirements. Other features include: a 240mm paper entry opening (suitable for A4 shredding); a reverse option to help clear paper jams, quiet operation at only 56 dB, a paper feed with overload protection to help reduce jams; an EcoSmart feature with very low power consumption of just 0.1 watts in standby mode; and castors for easy mobility around the office. 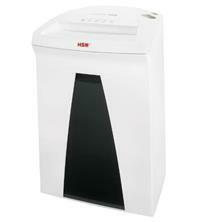 The shredder can also be used continuously if required, so there is no need to wait for any cool down period. For your peace of mind the HSM Securio B24 Cross-Cut Shredder (4.5 x 30mm) comes with a 3 year warranty on the machine and an HSM Lifetime Warranty on the hardened solid steel cutting blades.